After reeling from budget shortfalls since cutting income-tax rates three years ago, Kansas is considering a once-popular fix for cash-strapped governments: bonds secured by the money received under the 1998 settlement with tobacco companies. The sale would be the first offering of the securities in the U.S. municipal market since March 2015 as the decline in smoking over the past decade cuts into the annual payouts, leaving less to borrow against. States and localities have already sold $34 billion of the bonds, a niche that’s rallied as cigarette sales steadied last year and investors plowed into higher-yielding debt while interest rates held near a half-century low. The proposal floated by Republican Governor Sam Brownback illustrates the continuing financial pressure on the state, which borrowed $1 billion in August to shore up the employee retirement system. It has since had to cut spending for higher education and plans to put off pension contributions after tax collections fell short of its forecasts. In late 2015, Kansas borrowed $400 million for transportation after using highway funds for other expenses. The prospective debt sale — which would need approval from the legislature — has drawn criticism for failing to permanently address the state’s budget problems and for potentially siphoning money away from children’s programs now paid for with the approximately $60 million a year received from the settlement. That includes mental health services, child-care assistance and hearing programs, among others, said Shannon Cotsoradis, president of Kansas Action For Children, an advocacy group. 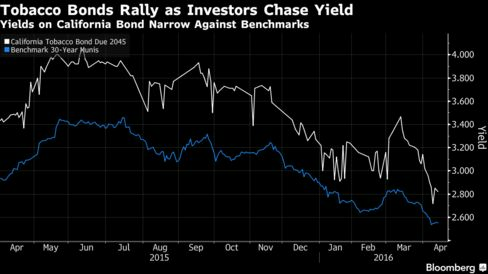 “Selling bonds backed by this money is a one-time fix that comes with a high price tag,” she said. Kansas could get $474 million to $782 million through a tobacco bond-sale, depending on how much of the settlement money it wants to pledge. Lawmakers will weigh the idea later this month after they return from a recess and officials receive new revenue estimates, according to Eileen Hawley, Brownback’s spokeswoman. Since deep cuts to income-tax rates became effective in 2013, Kansas has patched budgets shortfalls with one-time fixes that leave it facing deficits again when the next year begins. “The question is how are you going to solve the problem next year?” said Dave Hitchcock, senior director at Standard & Poor’s. Brownback, a former U.S. Senator who became governor in 2011, had said his state could become a model, predicting the lower levies would strengthen the economy and create more jobs and tax revenue. Kansas has since seen revenue fall short of forecasts, and in 2014 its economy expanded by 1.4 percent, compared with 2.2 percent for the U.S. overall. Kansas drew down reserves and raised taxes in the year that began in July, though revenue has still come in 2 percent below estimates so far. On April 8, Brownback’s administration said it would temporarily delay payments to employee pension plans due on April 15 until new revenue estimates are available. Tobacco bonds are one of the highest-yielding corners of the municipal market, in part because of the risk that the securities will default as people cut back on smoking. But as gas prices tumbled last year, leaving consumers with more to spend, cigarette shipments slipped 0.1 percent, the smallest drop since 2006, according to regulatory filings by Reynolds American Inc. The securities have returned 5.2 percent over the past year, beating the 4.8 percent advance in the overall market, according to Bank of America Merrill Lynch indexes. California sold $1.7 billion of tobacco bonds in March 2015, with 30-year debt yielding 3.38 percent. The prices have since risen, pushing the yields down to an average of 2.69 percent in trading Wednesday. “Securitization of the tobacco settlement is one of several options the legislature can consider when they return,” said Hawley, the governor’s spokeswoman. Some may be skeptical. The state’s House of Representatives are focused on finding long-term solutions for eliminating deficits and “reforming the budget process,” Republican House Speaker Ray Merrick said in an e-mailed statement. “It’s important that any decision regarding securitization of tobacco funds be made with full understanding of potential benefits and drawbacks,” Merrick said.